When it comes down to it, farming crops is essentially just managing a garden on an extremely large scale. Although not everyone can be a farmer, just about anyone can be a gardener. Whether you’ve got a wide open space, a nice little plot of land in your backyard, or simple pots to put your plants in, gardening is something that everyone can do. As irrigation experts, our team at Gra-Mac Irrigation is highly familiar with farming, gardening, and every method under the sun of keeping your crops and plants watered. As such, we know a thing or two about gardening. 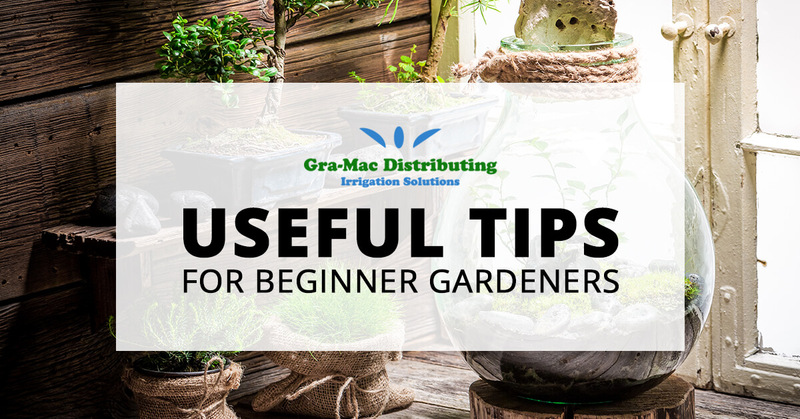 Here are some tips and tricks for beginner gardeners. Understanding where the sunlight travels on your land is tantamount to having a good garden. Edible crops typically need about six hours of sunlight a day (or more) to thrive, so if you plant a garden in a spot that’s perpetually obscured by shade, you’re going to have a bad time. Take a few days and track the sunlight. See how shadows fall, and observe how they change. You’ll want your garden in a spot that has as much direct sunlight as is possible throughout the day. Water is the component that will make or break even the most well-intentioned garden. Just as with humans and animals, plants cannot survive without water, and if you deny them their nutrients, it’s not a question of if they will wither, it’s a question of when. If you’re operating a smaller garden, it might be as simple as hydrating your plants with a gardening pail. Slightly larger gardens might require you to bust out the hose, perhaps taking advantage of one of those screw-on sprinklers. If you’re operating a larger garden, actual irrigation systems could be a viable option for you. Drip irrigation technology can work for operations that are much smaller than farms and could absolutely be an option for you. If you’re wondering what kinds of products you could invest in for automatic watering systems, check out our selection of irrigation components! If you’re not investing in an irrigation system, make sure that your water supply is nice and close. There’s nothing that takes the wind out of your sails quite as quickly as needed to take multiple trips back and forth to water your plants. While this is common knowledge for seasoned gardeners and farmers, there are a lot of people who are unaware of what plants are capable of growing in their climate. Think about it though — there is a reason why you don’t see cactuses in the jungle or ripe orange trees in the alpine mountains. Every plant survives under different conditions, and you need to understand what will survive in your garden. North Carolina is a good gardening state because the climate sustains a large variety of crops. But regardless of whether you’re in NC or somewhere else in the country, the best thing to do is to do an online search and get the facts, before you go out and start buying seeds. Similar to the point above, there is more research you’ll have to do about your specific region. Essentially, there are certain windows in the year that are viable for farming and gardening, and it’s good to know those. The most important dates to stay on top of are the frost dates. There are two frost dates you need to be aware of — the last one of spring, and the first one of fall. While you can sometimes garden year-around depending on your location, planting between the two frost dates is the best way to get the most mileage out of your crops during the summer, which is prime time for many plants to bloom. But, again, it pays to research. There are many crops that are seasonal, and not to summer, so just make sure you understand what grows when! There are essentially three ingredients to gardening, and we’ve covered two — sun and water. The third one is soil, which is equally as important to sustaining your plants. Soil has a tremendous effect on your plants. Soil, depending on location and environment, tends to have varying levels of alkaline, acidity, and pH. One of the best things you can do is take your soil in to be tested. A soil test will tell you what kind of levels your soil has, helping you to understand what kinds of plants will thrive, or inform you of what you need to do to make changes. You can get a soil test at most local nurseries, or if you’d rather go the DIY route, you can usually find home-testing kits at home improvement stores and gardening shops. One of the most critical (and easiest) mistakes a new gardener can make is biting off more than they can chew. It’s easy to get ambitious when you start your new garden. You might want to buy a wide variety of interesting plants, organize them into meticulously planned out layouts, and give them the time and attention they need day after day, but it’s important to be a realist. Are you really going to do all of the work it takes to manage a substantial garden? Some have the discipline for this, but most who try this end up with more they can handle, resulting in a failed garden. Experience and expertise are invaluable in gardening, and you’ll get that even by managing a small selection of plants. Start off small, and once you’re comfortable tending to your first plants, slowly expand. If ever there was anything that is the opposite of a race, it would be gardening. Finally, it’s important to mention how invaluable it is to have the right tools when you’re gardening. Something that can be a huge boon to your garden is a functioning irrigation system. While we usually think of irrigation in the context of a large scale such as farming, there are smaller systems that you can implement that will make watering an effortless process. At Gra-Mac Irrigation Solutions, we provide all kinds of components for irrigation systems. If you’re looking to improve your irrigation setup in North Carolina, browse our products or contact us today!